For those justifiably worried about the chronic shortage of 19 million units in urban housing in the country, there is good news. Knight Frank, the independent international property consultant’s seventh edition of its flagship half-yearly report titled India Real Estate, says its field surveys in the Mumbai Metropolitan Region (MMR), Delhi-NCR and Bangalore establish that the affordable housing scheme has received very good response thus far. Given the enormity of the problem, any forward moment is welcome. The economically weaker sections (EWSs) and lower-income groups (LIGs) account for 96 per cent of this 19 million shortfall. If this Knight Frank report is to be believed, the government’s effort to meet this huge gap between housing demand and supply through the “Housing for All by 2020” initiative, is paying dividends. “In the MMR, affordable housing projects have already started taking shape,” Pankaj Anup Toppo, vice president, research at Knight Frank India, points out in a report titled “Push to Affordable Housing”. For example, Xrbia Chembur Central in Ghatkopar, a Mumbai eastern suburb project developed jointly by Xrbia Developers and Crystal Group, is one such example. Ruparel Realty’s affordable housing project in suburban Kandivali West in Mumbai is another example, points out the report. “Instances of affordable housing schemes like the ones mentioned above, are yet to be visible on ground in markets like Delhi-NCR and Bangalore, but during our field visits, it was noted that a number of leading developers have plans to realign their business objectives and build more modest and affordable apartments,” said Toppo. Their plans are still in the initial stages, with a few affordable housing projects expected to be launched in the months ahead. Tata Housing under its 100 per cent subsidiary Tata Value Homes, has introduced two pan-India brands called Shubh Griha, which concentrates on the value homes segment and New Haven that targets the affordable housing segment. “Being a pioneer in introducing the concept of affordable housing in India, the company has aggressive growth plans in the affordable space,” Rajeeb Dash, head – corporate marketing at Tata Housing told Financial Chronicle. The company has delivered over 7,000 apartments in the both value and affordable segments. “We have affordable housing projects in locations such as Boisar, Vasind near Mumbai, Bahadurgarh in NCR, Chennai, Boisar, Ahmedabad, Pune and Bengaluru. We launched our second project in Boisar and as part of our expansion plans for the NCR region, we have also launched New Haven Bahadurgarh and Noida last year,” points out Dash. 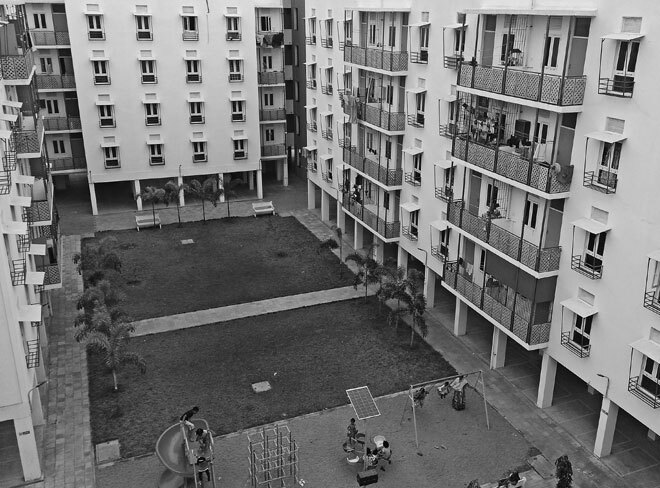 Mahindra Lifespaces too has forayed into affordable housing segment with its brand ‘Happinest’ and has two ongoing housing schemes in Chennai (‘Happinest, Avadi’) and Mumbai (‘Happinest, Boisar’). Happinest Apartments are priced Rs 18 lakh-Rs 23 lakh onwards (approximately for 1 BHK and 2 BHK homes) and have been designed and developed for people without deep pockets. “More than 440 families are currently in residence at Happinest, Avadi and handover is ongoing at Happinest, Boisar,” Sriram Mahadevan, business head at Happinest, Mahindra Lifespaces told Financial Chronicle. Mahadevan says that the firm is at present working towards launching its third affordable housing project called ‘Happinest, Palghar’, located about 87 km north off Mumbai. Samantak Das, chief economist and national director, research at Knight Frank India, points out that he had seen progression of affordable housing project in cities such as Mumbai, Delhi, Kolkata, Bangalore and Pune. “The ticket size is below Rs 25 lakh up to Rs 50 lakh, although the concept of affordable housing is not defined by value in the country, as it varies from city to city and town to town,” he explains. Among other incentives given by the government, developers get a tax holiday on profits for five years. Sectoral insiders are convinced this is the best time for affordable housing. “There has never been a better time than today for affordable housing in India,” said Ashwinder Raj Singh, CEO at Anarock Property Consultants told Financial Chronicle. The segment has lost its ‘down market’ label, becoming a serious and respectable business sector for real estate developers, he explains. In order to achieve the ‘Housing for All by 2020’ target, the central government has taken varied initiatives. For example, it has facilitated a 4 per cent interest rate rebate on housing loans of up to Rs 9 lakh. The rebate stands at 3 per cent on loans up to Rs 12 lakh. Besides, the government has also granted infrastructure status to affordable housing. Developers can enjoy cheaper sources of funding, including external commercial borrowings (ECBs). Affordable housing promoters have got five years to complete their projects, up from the current three years deadline. Developers will also get a year’s time to pay tax on notional rental income on completed, but unsold units. The tenure for long-term capital gains for affordable housing too has come down. The new tenure is two years, as against the earlier three. Sobha, the Bangalore-headquartered and listed real estate major, has stepped into a new segment called Dream Series. Of this, the first project is Dream Acres, an 80-acre campus, providing 6,500 homes in the garden city itself. Starting with a price tag of Rs 35 lakh for 650 sq ft apartment, it prefers not to term it as an affordable project, but for the price line, it could very well be just that for a large section of society. “At present, we are not into the affordable segment, but we will come into this segment in the near future,” an official from Sobha told Financial Chronicle. Xrbia Developers’ Nahar says that very often, the terms ‘affordable’ and ‘low-cost’ are used interchangeably. Whereas, both are in fact very different when it comes to their actual definitions. Affordable houses are built with reduced costs, keeping high-quality standards intact. That section of society whose income is below the median household income can purchase affordable housing units. Nahar defines the bottom line. “In India, a dwelling unit not more than 30 sq mt (323 sq ft) in four metro cities and not more than 60 sq mt (645 sq ft) in other cities and uses 50 per cent of the FSI, is categorised as an affordable house,” he points out. That apart, the size of the house could only be affordable if the price of the house can attract the lower income category, states Nahar. So far, the major challenge in affordable housing is land availability and the new public private partnership (PPP) model has the potential to make affordable housing possible, if implemented well without many complexities, she explains. The new PPP policy for affordable housing in India is drafted to minimise risks like land, financing and capital investments, maintenance and recovery of the capital invested, explains Arora. The government has developed a policy to encourage participation of private players to develop affordable housing through financial and non-financial support and cross-subsidised models. Proactive participation of private players in these PPP models should reduce the burden on the government and the developers. As land is the costliest commodity in real estate, the government has come up with alternatives for PPP model in affordable housing such as private land that can be developed for intensive utilisation, such as higher FSI or in exchange for permission to build high-end housing. The policy is drafted keeping in mind that the developer will not have to bear the land cost and will invest in cost of construction, which can be recovered with additional profit through models. Nahar claims that Xrbia with a sale and build rate of 2,000 houses a month is India’s affordable housing leader. “Our use of ground-breaking technology across construction, management and operations, delivers a product that changes the way the world houses its people. We are redefining legacy processes and delivering cities that will help to tackle the exponential increase in housing demand across India,” he asserts. By 2030, India's housing shortage is expected to be an estimated 120 million houses, costing an incredible $2 trillion, says Nahar. By building 100 new cities, Xrbia hopes to meet 1 per cent of this need. The company delivered its first project of 680 houses in 2012 – even before the term affordable housing gained coinage – at the Chakan industrial zone near Pune, followed by the successful launch of selling 3,233 houses in Hinjewadi, Pune. This year alone, Xrbia is building across 18 locations in India and have launched 40,000 houses, claims Nahar. Xrbia, he says understands India's need for smarter, efficient, and sustainable cities. Hence, it provides end-to-end urban infrastructure services to enhance the quality of life and living experiences of its residents. “Xrbia matches the global trend of increasing affordability by designing compact homes and offering amenities like free car park, community centre with swimming pool and commercial complexes all within its townships,” he explains. All stakeholders point out that the challenges facing this sector is land acquisition in the four metros, which makes the entry costs for real estate developers significantly higher than in other locations. In addition, the lack of affordable land options within city limits typically pushes affordable housing development to peripheral areas. This in turn often poses a challenge to the customer in the segment, who requires efficient connectivity to areas of work in city business districts. Project locations must therefore be carefully chosen, with good connectivity/transit options to facilitate ease of commute and reduce travel. Well, leading developers have shown the desired interest, as 2017 promises to take affordable housing to another level.